Offers a simple sample dispensing method being a straightforward PTFE or stainless steel dip tube. The operator simply offers up a handheld sample bottle to the dip tube and operates the sample valve to acquire the sample. This option is intended for samples that are not toxic or dangerous to the operator. The bottle vents freely into the atmosphere around the dip tube. The most common type of sample dispensing supplied is the PTFE threaded bottle connector. The operator screws the sample bottle up into the adaptor before taking the sample. The threads on the bottle adaptor are machined to suit the customer’s own sample bottle. The bottle adaptor has an integral vent supplied with a PTFE compression fitting and a short length of PTFE tubing to carry fumes away from the operator. This can be piped into the site process vent system if required. The sample bottle is fitted with an aperture cap and septum to seal the contents of the bottle from the atmosphere. The sample bottle is offered up to the sample valve and pushed on to the two non coring needles which puncture the septum - one for filling the other for venting. As the operator fills the sample bottle, the fumes from the sample media and bottle travel safely down the vent line away from the operator. When the bottle is pulled free from the needles, the septum seals the bottle preventing fumes or sample media from escaping from the sample bottle to the atmosphere or the atmosphere entering and contaminating the sample. Syringe samplers differ from the other types of sample dispensing methods as no sample bottle is used. Instead the sample is drawn directly from the process and contained within a borosilicate glass tube within the syringe assembly. 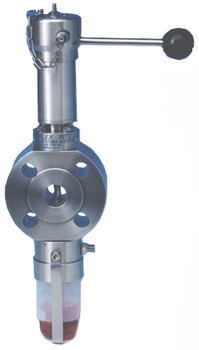 The sample is automatically taken from the sample valve when the syringe is offered up to its mount using a pin and cam arrangement. When the syringe is released the sample valve and syringe automatically close preventing any release of fumes or product. The sample is contained within a borosilicate glass tube contained within a sturdy stainless steel carrier. The syringe can then be taken to the lab and safely dispensed using the syringe dispensing attachment. For additional protection, sample bottles can be contained within a safety cabinet. When samples are to be taken from hot process lines, we offer a range of heat exchangers to cool the sample to a safe temperature before being dispensed.